Needless to say, the room was a mess with four lots of stuff everywhere. Phone, sat-nav and computer recharge plugs competed for socket space in the corner. We each had a large 'curver' type plastic box for easy loading on the van, mine contained everything bike related. My holdall was designated as day bag for spare clothing and rations required en-voyage. Finally my Berghaus rucksack was (over) stuffed with clothes and everything else including electrical items in a dry bag. My daily morning preparations involved a long hot shower followed by the application of copious amounts of Savlon to the nether regions. Nicely lubricated, I squelched over for breakfast in the upstairs dining room. It was a lovely bright morning as I joined Gav and Haydn outside the hotel after breakfast and took a few photos whilst waiting for the circus to start. There was a distinct feeling of anticipation, mixed with trepidation and excitement. We cycled down to the little car park where the vehicles were still secure. Back in the square outside the hotel, there began a period of faffing as stuff was allocated between the van, bus and trailer. The landlord signed the first box on our end to end verification forms and eventually, we set off for the short drive to Land's End. The place was relatively quiet. 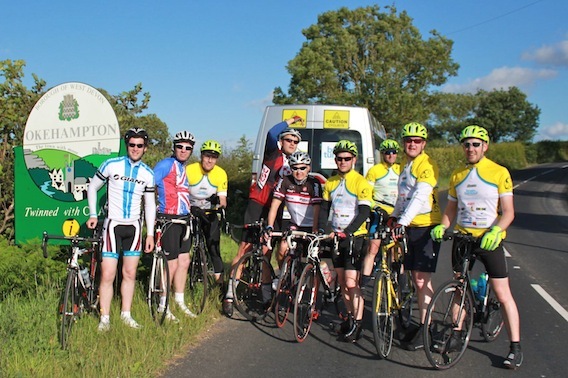 We watched another cycling team set off on their own LE2JOG journey. After unloading, I had some personal faffing time preparing for a day's cycling, filling bottles (one grape juice, one water), programming the Garmin, stashing food about my person (jelly babies, nuts, energy bars) and taking a prophylactic dose of ibuprofen. We rolled round to the signpost at the back of the LE 'attractions' and posed for photographs in the sunshine with the blue sea and blue sky as impressive backdrops. Then came the momentous 'deep intake of breath' moment as we lined up to cycle as one under the Land's End archway. I pressed start on the Garmin and it began recording the first miles of the 939 as the thin pink line showed the way. The sun shone brightly, I tried to put the immensity of the task out of mind. Our route was to follow the A30 all the way to Okehampton with a planned lunch stop at McDonalds half way. We'd already seen the hills from the bus on the journey down so we knew what was ahead. The first part was a quiet country lane up and over, then the busier Penzance ring road down to sea level with a brief glimpse of St. Michael's Mount in the bay. Turning inland we crossed a few small hills to reach Hayle before a general climb past Camborne and Redruth and on through the middle of Cornwall. The technique on the road was for the riders to be protected by one support vehicle behind and one in front. This worked well especially on the long stretches of dual carriageway where we effectively had the inside lane to ourselves. For the entire length of the A30, we enjoyed the support of other travellers who 'tooted' horns as they overtook our convoy, brilliant. In addition, Anne and David in their car provided much needed support and encouragement along the way. We stopped a few times for bike adjustments, clothing changes, food, drink and toilet breaks, eventually reaching the McDonalds at Penhale. Something magical happened here which set the scene for the rest of our journey. Rob and Haydn had run in the Olympic torch relay. As a result, we had two Olympic torches which once taken out of their beige cotton bags, gleamed in the sunshine and instantly caught the attention of people nearby. Within a few minutes, a largish queue had formed to have pictures taken with a torch. The sheer delight on the faces of children as they posed was wonderful and we soon came to realise just how many people are affected by brain tumours from all the stories we heard. As well as raising awareness of this terrible disease, we of course collected a small fortune in donations. My food choice was directly related to calorie content, which as it turned out meant ordering a large chicken deli sandwich meal (590 calories). I was surprised that it was a deli option which I'd always assumed was the healthy range, I gave away my free glass to a very (overly) grateful woman. We avoided a large hill by cycling through Indian Queens, but soon came the considerable ascent over Bodmin Moor at nearly 1,000 feet. The sky grew darker and we stopped at the turning for St. Breward when the downpour hit. Rob had provided us all with transparent waterproof jackets which were in the van and everyone tried to find shelter from the wind to put them on. Impressive faffing delayed departure until everyone was chilled to the bone, not that sensible on top of Bodmin Moor. Later, we stopped for a break and Gav discovered that he'd ridden 70 miles or so with his brakes rubbing. Rob offered Gav his spare bike, however after a brief search it became clear that it wasn't in the trailer nor the van. Much head scratching later, we decided by a process of elimination that it must still be at Land's End, which was confirmed by a telephone call much to Rob's relief. Anne and David were despatched to drive back to LE to fetch the bike. We dropped down to Launceston for the final stretch before the final impressive climb up to Okehampton. It has to be said that my own climbing ability is second to everyone as my usual method involves dropping through the gears and grinding away at a steady cadence. This was fine for me, but I could hear the strain on the bus's engine and gear box a few metres behind. Alan and Dale told me later that they'd had a good view of my backside as they watched the chain click to ever lower gears, willing me on they'd wanted to get out and push! We turned off onto the A386 at Sourton Down towards Okehampton. We dropped down Upcott Hill to our resting place for the night, Upcott House. There was a slight kerfuffle regarding room allocation (which was starting to become a theme following arrival) with Gav, Haydn and I sharing a room once more. Unfortunately, it had a single and double bed and none of us was keen to share the double. Haydn found the answer by emptying the contents of the wardrobe and making up a bed on the floor, I had the single whilst Gav had the double to himself. I tried and immediately rejected the recommended cold bath muscle recovery technique in favour of a nice warm soak. Breakfast was ordered by filling in a form designed for a couple, the three of us made a complete hash of it resulting in some level of chaos the next morning. Later, we took the bus down into town and had a meal in the function room of the Plymouth Inn.